A blog focusing on things i find interesting. Mainly technology related stuff like programming and GNU/Linux. After contemplating whether to purchase the Asus X205TA after reading many forum posts about how difficult it is installing *nix on to it because of it's 32bit efi bootloader. I went and bought it anyway thinking of it as a challenge to get arch on to it (and I did) so here I am documenting the process. Everything else works, there are some things I haven't tested yet though..
A spare USB WiFi adapter OR an Android phone with a cable ( for tethering since wifi will not work in during install for kernel < 4.0 ), I used my android phone for this since I didn't have a spare WiFi adapter. A USB at least larger than 2GB as an installation medium. after you have the iso you will need to extract it. 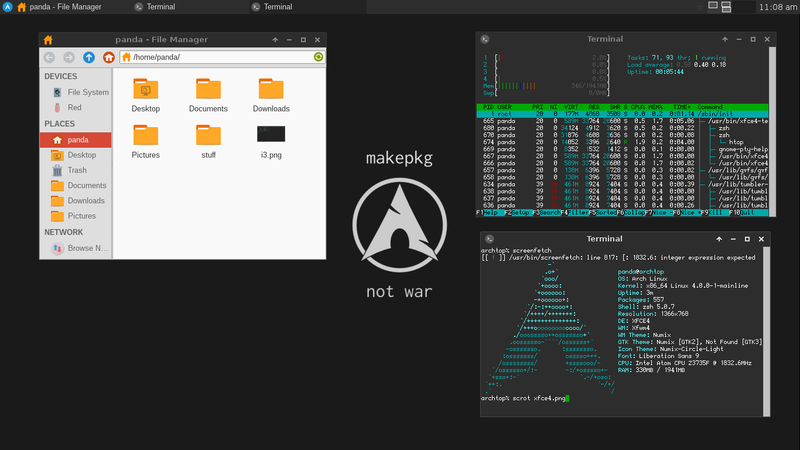 Look here for more details (https://wiki.archlinux.org/index.php/Remastering_the_Install_ISO) scroll down to “Extracting the ISO” section. The purpose of the “bootia32.efi” is because the laptop only supports 32 bit bootloaders so since arch doesn't include a 32bit efi loader by default we had to make one for it. Now you can re-build that iso. It's probably a very good idea to read “https://wiki.archlinux.org/index.php/Remastering_the_Install_ISO” and follow the instructions there for “Create a new ISO” image. Note: Use the same iso label as your untouched arch iso. The part "ARCH_201412" is the iso label you should use when you run 'genisoimage', so substitute this part in the next command with whatever label the above command gave you. After you have your ISO you can now create a bootable USB from it. For this part I booted into my windows partition and used Rufus (https://rufus.akeo.ie/) since dd failed to make a boot-able usb for me so for this part of the tutorial you will need to boot into windows for this or you can try dd, or another way to make a boot-able usb but Rufus is yet to fail me. open up the ISO file you created and start the process. After rufus is done making the usb continue. plug in your USB into your shiny X205TA and boot it up. It should ignore your USB and boot into windows 8.1 instead (don't panic, it's fine). “Change PC Settings” > “General” > “Advanced Startup” > “Restart now”. After it restarts click on “Use a device” and select your USB. If all went well your usb should have booted and you'd be in a root shell. I would Highly suggest you do not dual boot and remove all the partitions first. you can create a separate /home partition and also create a SWAP partition but really not necessary. After rebooting you should be booted into your arch system. After you've installed your base system we can now continue to fixing various parts to get it working with x205ta. However I have not tested this method. You can compile the 4.0 kernel on your main machine and just copy over the install files on a usb or compile them on the laptop. After rebooting check with “uname -a” if you're running the 4.0 kernel. note: you'll probably have to tether with your android phone again to get wifi in order to download the drivers to install. Your WiFi should now be working. enjoy your super light weight arch laptop! After testing, i realized that the laptop would freeze almost always during graphic intensive games like minecraft. So this led me to believe the main cause was something to do with the gpu frequency. So what we want to do is underclock the gpu. We then change the max frequency to 333.
you would need to type in that command every reboot as root or if you're lazy like me you can make a script to do it for you!. I used the "session-setup-script" option from /etc/lightdm/lightdm.conf, so the script is executed as root when i log in. This almost fixes the freezing; It still occurs but much more rarely. Photo of how it looks. The screen looks faded but it's not noticeable at all when facing it head on. Could you please share your custom ISO file? can you provide your nvram-blah.txt? I tried to search /sys/firmware/efi/efivars but there's no file starts with nvram-*. I tried to copy that file to /lib/firmware/brcm/brcmfmac43340-sdio.txt, but modprobe fails with error -22.
is your file also a 10-byte binary? or is it something text-looking? The file is around 2.7 kB, and can be edited/opened in an editor. I get around 9-10 hours, sometimes more. Hey, thanks a lot for the info. Is this completely formating the drive or dual-booting is possible? And is the audio still not working? The tutorial focuses on completely removing windows. You can setup a dual boot if you want although i wouldn't recommend it since windows is going to take up a lot of space. Hi, I'm interested in having the same setup as you. Just wondering about two things, first is how do you find this setup and laptop? Do you like it other than the fact the audio isn't working? And lastly, Linux 4.1 has been released on Arch's core repositories if I'm not wrong. I'm just wondering if you have updated and how your laptop took it. The setup i am using is awesome; I don't mind the audio so much since i mostly use this laptop for taking lecture notes, and working on programming projects during long train rides. 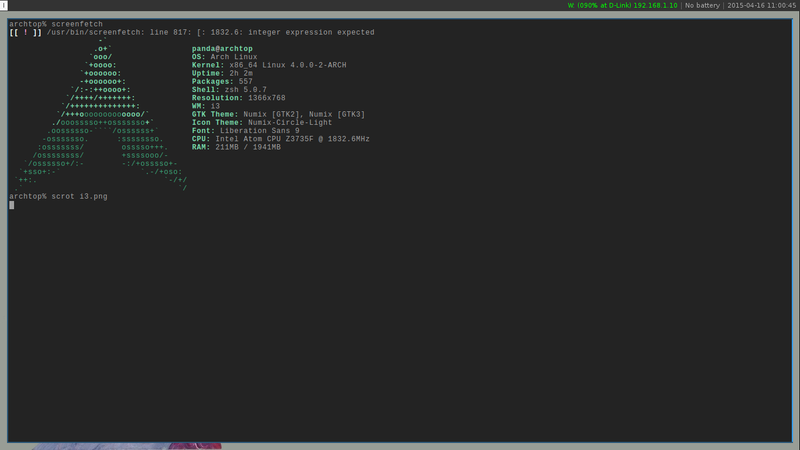 I'm running the 4.1.0-1-mainline kernel which i compiled myself to get battery status working. However i also tested the current 4.1.3-1 kernel from the base repo which works great except for battery status which doesn't work unless you compile your own with custom options. I don't know what could've gone wrong. Are you getting any errors? Maybe something went wrong with your install, or there's something wrong with your grub config file. When you get to the grub menu press 'e' which should allow you to edit boot parameters. That is a label issue. When creating a bootable usb with rufus you need to lookup the iso label it automatically assigns and use it to modify grub.cfg and everywhere it appears. You used "ARCH_201209" which is old and cannot be used anymore. Since you don't warn against this I think a lot of ppl will run into such problem without even knowing what caused it. Yeah i forgot to mention the label part. use "file originalArchiso.iso" command to get the correct label to use. use the "ARCH_201412" as the label when you run genisoimage. Another thing, I was able to install Lubuntu on this machine and with their latest available kernel 4.0.3 everything seems to work fine except audio and suspend which I think is current biggest problem of this machine. I did what you said to get the battery monitor working but nothing has changed. I still cant get the battery monitor to show the right values in the xfce4 panel. and select "Arch Linux, linux-X205TA" in the grub menu. may be problem with the specific file sharing website in my country.. can you share it via google drive? I use "xbacklight" to set brightness from terminal. 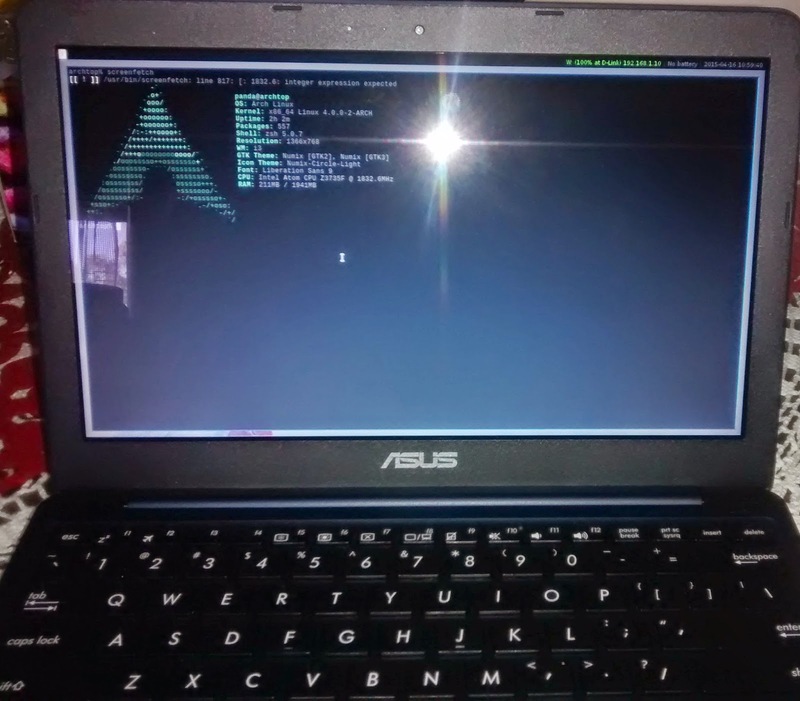 Thanks for the post, I just purchased and ASUS x205ta and plan on installin' arch. Hope I can get it working well. It's a great little laptop, if you don't mind the freezing although it rarely happens. I use it as my lightweight uni laptop for taking notes and programming. Would ssh work fine on this thing? Like I said, I have a powerful linux server back home from which I work so I'd probably connect to it. Would this laptop suffice ? Guys, is their any hope in getting the sound working for this device?? i installed archlinux on the tiny little thing for no more than 1 day, but already encounter more than 5 times system freezing!!!! do not know how to settle this problem. Yup, just updated the blog on how to almost fix it. can you please upload bootia32.efi file.The current link seems to be down. but i dont see the LABEL here... i dont know what i'm doing wrong. Amazing guide I will try it on my ASUS EEEBOOK X205TA and will give review. Could I trouble you to compile another .efi file but with "ARCH_201609" instead? Doesn't seem to be a way to compile EFI files on Windows. And just using the one in this guide gets me the black screen another commenter mentioned. Nice blog. Found this while searching through. And these blog is very good..
Nice blog. This is a useful information blog. Your blog contain lots of information. It's such a nice post. I found your blog through my friend if you want to know about more property related information please check out here. With the experience of over 3 decades, Agrawal Construction Company is the biggest and the best builders in bhopal and the trust holder of over 10000 families. Agrawal Construction Company Bhopal is serving society, building trust & quality with a commitment to cutting-edge design and technology. Agrawal Construction Company's vision is to 'building trust & quality' which extends to developing residential, commercial and township projects in all the directions of the beautiful City of Lakes Bhopal and hence it is among the top builders in Bhopal. Currently, it has four residential such as Sagar Pearl, Sagar Green Hills, Sagar Landmark and Sagar Eden Garden. I am trusting a similar best work from you later on too. Excellent style of Working of this Blog! Lip glosses keep lips moisturized and add a shine. In today's race of competition advertisement and presentation of lip glosses play an outstanding role? Custom lip gloss boxes serve both the above mentioned needs. A custom designed box with company's name and logo imprinted on top becomes a signature of your brand. It plays a miraculous role in recognition of brand. customboxeszone.com offers variety of custom lip gloss boxes with free designing. We make your custom boxes more eye catchy by using latest printing techniques and embellishments. We are completely aware of that fact that packaging of a product plays an important role in its success or failure. Therefore we use excellent materials with high quality ink with modern printing styles to make your packaging experience astonishing. The commitment to manufacture error free Custom Lip Gloss Boxes has made us most preferred box making agency in market. We are available at any time of the day to serve you and answer your queries.